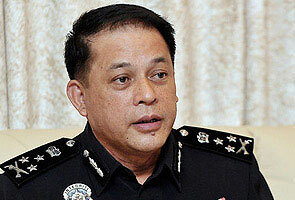 KUCHING: The Royal Malaysian Police (PDRM) has no problem getting the Chinese in Sabah and Sarawak to join the police force, according to Deputy Inspector General of Police (IGP) Datuk Seri Mohd Bakri Mohd Zinin. He said the PDRM did not face any shortage of Chinese officers, from the rank of inspector and above. However, he noted that there was a lack of enthusiasm among the Chinese community in the peninsula to join the force as constables. "Presently there are about 1,000 Chinese policemen or 1.5 per cent of the 115,000 personnel that we have," he told a media conference after officially opening the Tabuan Jaya police station here on Thursday. Mohd Bakri said to encourage more Chinese to join the force, their entry requirements including a pass in the Bahasa Malaysia subject would be eased. "This is our country and it is our obligation, whatever race we belong to, to protect our nation. The police are not serving just one race but all the races," he said. Mohd Bakri said the PDRM had targeted to recruit 5,000 Chinese in the next five years. He also assured that salary-wise, the police workforce were paid a higher salary than other enforcement agencies in the country. On Wednesday, Home deputy minister Datuk Dr Wan Junaidi said a police recruitment drive had to be done annually to match the 1,500 posts left vacant yearly due to retirement. Earlier in his speech, Mohd Bakri said the PDRM was committed to ensuring security and peace in the country. He said security and peace were an important indicator to spur national development and the aggregate for domestic and foreign speculators to consider investing in the country. "Focus is given in efforts to empower integrity, credibility and professionalism in the PDRM workforce towards world class policing," he said. Meanwhile, the Tabuan Jaya police station was built on Jan 17, 2007 and fully completed on Nov 18, 2008 at a cost of RM12.6 million. Mohd Bakri said the station began operations on July 3, 2009 with a work strength of 38 personnel headed by a police inspector.